We understand that settling in a new place and making it home for you and your family is a challenging and long process. No matter where you are from or how long it has been since you arrived in Canada, we welcome all newcomers to access support services and community involvement opportunities here at Frog Hollow. Our programs are designed to help you successfully navigate the stages towards citizenship and further on, for your longterm wellbeing and participation in society. One-on-one service includes one-to-one settlement plan, information & orientation, permanent resident card renewal, citizenship applications, career planning, BC housing applications, rental assistance, benefits applications (income assistance, tax credits, OAS, child care subsidy, CCB, school enrollments, etc. ), medical applications (MSP, MSP premium assistance, PharmaCare), free English lesson referral, and so much more! One-on-one service is available in English, Cantonese, Mandarin, Arabic, and Spanish. Join us for a 6-week program! Workshop in Chinese, light lunch and childcare provided. A free 16-week program that provides great information and empowering workshops for women with permanent resident status! Child minding, coffee, and healthy snacks provided. Come join us to try and learn English! One-on-one service in Spanish. 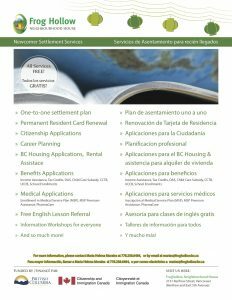 Services include one-to-one settlement plan, information & orientation, permanent resident card renewal, citizenship applications, career planning, BC housing applications, rental assistance, benefits application, medical applications, free English lesson referral, and so much more! The BCSIS program is to support the social and economic integration of newcomers to the province. The program supports newcomers who are not eligible for federal settlement services, specifically, Temporary Residents working in B.C., Provincial Nominees who are awaiting for permanent residency, Post-secondary International Students, Refugee Claimants and Naturalized Citizens. The Youth Settlement program offers newcomer youth who are new to Canada a safe place to learn about Canadian culture, their community, and practice their English. The Youth Settlement program runs from Frog Hollow Neighbourhood House, Windermere Secondary School, Vancouver Technical Secondary School and Drive Youth Employment Services on various days. One to one youth settlement workers available on site. Arabic speaking youth workers available on site.